I'd say the key comment is Kerry's admission that "we believe we have compromised significantly, and we're prepared to compromise further." They should engrave that on the dome of the United States Capitol. Can we just drop the Supreme Court nominee hearings? SPECTER: I will put into the record what the justices have had to say. I've questioned almost everybody about this subject, and I've had the opportunity to question all of the people on the court now. But there's a lot -- there are a lot of those who have been favorably disposed to it -- or at least have acknowledged its inevitability -- and remind them that they all appeared on television this year on C-SPAN, and most of them -- many of them have appeared over the years selling books and being in a variety of situations. KAGAN: It means I'd have to get my hair done more often, Senator Specter. SPECTER: Let me commend you on...Let me commend you on that last comment. And I say that seriously. You have shown a really admirable sense of humor, and I think that is really important. TV and comics veteran Jeph Loeb has been named to a new position within Marvel, according to a press release, below. As Executive Vice President, Head of Television, Loeb will work on bringing Marvel's characters to television and oversee both development and distribution of their series efforts, both animated and live-action. 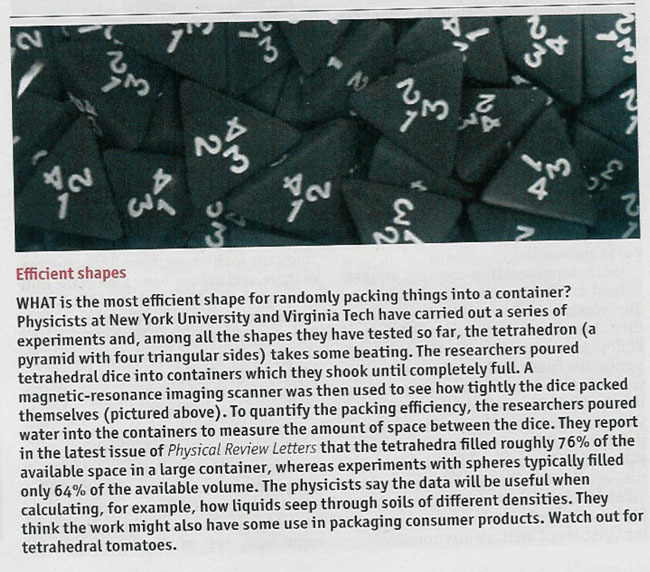 I just think it's funny that they used a picture of some D&D dice without any explanation as to what they are. Because everyone recognizes a d4, right? Don't really have anything to say about it. I just think it's cool. This video has made the rounds by now, but fnord12 hasn't seen it yet, so here you go. Yasmine Villasana, 22, failed to brake at the gate and sent her Chevrolet Impala flying into the sky. ... She landed on the other side, leaving half of her undercarriage lying on the charred booth but miraculously she and the toll booth operator walked away from the wreckage. ... According to police she was so 'sober' the officer even had to stop her getting back into her car when it burst into flames. Not only could i rent out my white guy, my white guy would totally be able to set up fake websites to look even more legit. Goddammit! NYT: Justice Clarence Thomas seems bored. Why doesn't he run for president in 2012?. Something we all should try? Alvin Greene is an unemployed veteran who has never held political office. After filing for the Democratic primary in the Senate race from South Carolina, his campaign seemed to stop. There is no Alvin Greene web site, no Alvin Greene bumper stickers, no Alvin Greene yard signs. There's not even an Alvin Greene FEC filing. So quit dropping the last comma, you lazy gits. NATO, geniuses that they are, only now have come to the conclusion that trying to get countries like the Ukraine and Georgia to join just might cause some conflict, "notably with Russia". R.E. Wall, director of Prescott's Downtown Mural Project, said he and other artists were subjected to slurs from motorists as they worked on the painting at one of the town's most prominent intersections. "We consistently, for two months, had people shouting racial slander from their cars," Wall said. "We had children painting with us, and here come these yells of (epithet for Blacks) and (epithet for Hispanics)."